Yoono is an app that congregates social media updates from many sources into a single column for easy viewing and updating. 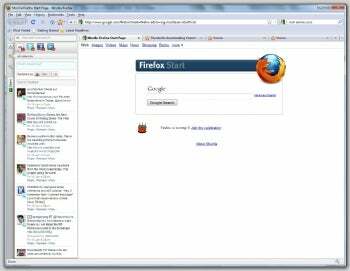 This is the free Firefox browser add-on version, which integrates Yoono functionality directly into the left side of the browser window, as well as updating in the form of pop-ups. It's nice to have that integration so that you can focus on more important Web sites, instead of constantly hitting reload on twitter.com, for example. Yoono also has a free desktop version for those who want to keep their browser clutter-free. Facebook, Twitter and LinkedIn merge together seamlessly in Yoono Firefox Browser Add-On.